Bob V had the most liked content! A long way from Top Notch work for sure. The rhino lined body tells me they are hiding bad body work and/or rust. I do not know if they will work, but I do think you are on the right track. The nice thing about the factory puck system is ALL the weight and dynamic forces are put directly to the frame. No going trough the thinner and thinner beds. I thinks it only $500 when you order it with a new truck. $125.00 savings, I think it is worth it. Looks like he tried to teach himself fiberglass doing the hevely modified dog house. I would say he failed as both the teacher and student. I can only image how hot things get under a hard pull. Proper way to tiedown, haul cars? Shawn, I am not trying to tell you what you should do, you and your wife are the only ones qualified to make these decisions. But, I do want to add one more thing. In the trips I have taken I woul NOT want a nice car on most of them. I have hit snow, mud, gravel, and some really rough roads, a lot of them need higher ground clearance. I ended up getting a 2007 Honda CR-V. It can be flat towed without modifications, is AWD, and has more ground clearance than most cars, and can get 30+mpg. Even with all that, I think it will go away and we will end up with a Jeep Wrangler. They are just a lot better suited as tow rigs for the places we want to go. Last thing, with you trck/camper and the trailer, you will be too long for a lot of state and national parks, with flat towed, they usually let you park the extra vehicle in overflow or next to your rig. With the trailer, you will have 3 rigs to park. I would be tempted to move this for you, but the insurance might be a problem. Then, I cant LEAGLY, move your trailer for pay. It probably be more hassle than it is worth. Next, how old and what brand are the tires? Can they make the trip? I need to stop by and look at this project. Do you need to replace the window glass? I am sure I replied to this yesterday but I don't see it now. In short, I have passed on staying at places because the look of some of the units. 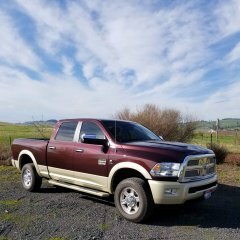 I was mostly referencing the statement on the home web page, just seemed kind of strong, and it doesn't mention age or condition, just types, many of which are be just as much or more money than the class A or C, Its possible to have $200K in a 5th wheel and tow vehicle, and easy to have well over $100K in both. First trip of the season. The hanger was cool, the kids loved getting INTO the 6 or so old flight simulators thay have. It worth a stop in my opinion. Not the same as the Evergreen, but you get up a lot closer to many of the planes. We spent the last two nights in Beverly Beach State park. Lot of kids for ours to play with. Only see them when the get hungry. Got the camper ready and decided to stay close to home (kid is on spring brake) First night in Tillamook. Today is the Tillamook county smoker, cheese factory, and the blimp hanger.